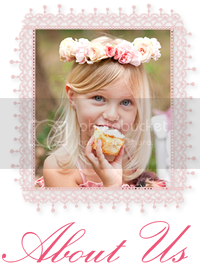 All My Love: Win A High Tea Gift Pack! Okay cookie lovers this is the ultimate giveaway just for you! 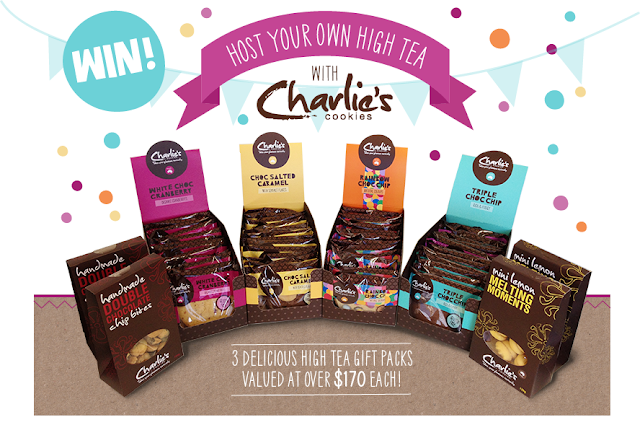 You could be hosting your very own high tea with thanks to Charlie's Cookies. We have 3 High Tea Gift Packs each valued at over $170 to giveaway! ~ 4 delicious boxes each containing 12x60g individually wrapped cookies valued at $144. Flavours include, Rainbow Choc Chip, Triple Choc (gluten free), their famous Choc Salted Caramel, and White Choc Cranberry (gluten free). ~ Plus 2x125g boxes of their handmade double choc chip bites valued at $14. ~ And 2x125g boxes of their award winning mini lemon melting moments valued at $16. So where can you purchase Charlie's Cookies? Since 2004, Charlie's has grown from a much-loved, local shop selling home-baked cookies to a well known Australian innovator and producer of seriously delicious gourmet treats. Based in Melbourne and proudly Australian, Charlie's is tantilising tastebuds throughout Australia. Whether it's at work, your local cafe, gourmet food store or flying the skies, Charlie's is putting joy into life one bite at a time. Charlie's are committed to ensuring their cookies are the freshest and tastiest every time, and use only premium ingredients from ingredient suppliers who care about food as much as they do. No preservatives or other nasties are used in their mixes and everything at Charlie's is made from scratch recipes. They're also 100% Australian made and owned! Charlie's Cookies are sold at Thomas Dux and will be available to purchase online at their new online store here within the next few weeks. 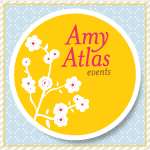 So stayed tuned on Facebook, or sign up for news and updates! So how do you win one of these delicious high tea gift packs? Simply be a fan of Charlie's Cookies on Facebook via Rafflecopter below. And if you want to improve your chances to win, we have bonus entries available! Invite others, again via Rafflecopter, and we will reward you! You can do this as much as you like! This promotion is open to Australian residents aged 18 years and over from 8.30pm on Tuesday 10 September, with final entries to be received by 8.30pm on Tuesday 24 September 2013. 3 winners will be randomly selected from all eligible entries on Wednesday 25 September 2013 and contacted via email. Results will be published here on Friday 27 September 2013.
Who would you invite to your high tea if you were to win a gift pack? White choc and cranberries for me. High tea with all my work mates would be a treat! I wanna try them all..
i'd invite my mum and grandma,3 grandladies having catchups and high teas ,I couldn't think of nicer people than thee. All my wonderful girl friends I play bridge with - Choc Salted Caramel is the one I would love to try first. I'd Invite my Imaginary Friends, So That I would not have to Share these amazingly delicious cookies! double chocolate all the way! I'd extend invitations to the new neighbours, a lovely way to break the ice and make an impression. I'd invite all the Mums from playgroup over so all the kids can have fun as well as the Mums! My Mum is alwasy doing little things for my siblings and I so I would give her this prize to share with HER friends! I'd invite my Dad. We are such huge foodies! I know he would appreciate each yummy treat as much as me! I would invite my Granddad who has been in hospital for the last 11 weeks and definately needs a treat! I'd have a tea party for my granddaughter! My mother is in a nursing home so I would have a high tea for all of the old ladies, it would be a real treat for them! As it's "High Tea" I think I'd bring someone very use to it, like say the Queen. But then if I'd had as many High Tea's as I imagine she's had...so then Mum and me it is then! Anyone who doesn't talk about mortgages,kids' schools,quinoa or other boring mandatories! I'd invite my mum my grandy and me, 3 fine ladies sitting down for high tea, their time is precious and so are their stories , I'd sip quietly and listen and bask in thier glories. All my mummy friends!! A day to relax and let the kids run wild haha! White Chocolate & Cranberry sounds rather special! I'd have a high tea spanning 5 generations! My great grandmother, grandmother, mother, myself and my darling son! My girlie pals for a high tea Melbourne Cup!!! I would love to win this yummy prize and have a high tea with my two princesses. Would love this!! Sound yummy!! I would love to have a high tea with my beautiful high school girlfriends who are still close, more than ten years after leaving high school! A group of tow truck drivers, they'd go down a treat!